An Ivory and Merchant film that is - as all Ivory and Merchant films are - exquisite. 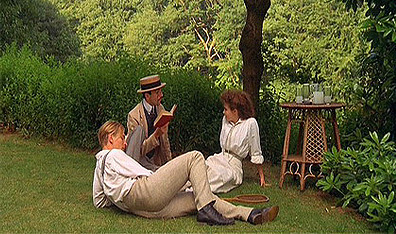 A Room with a View puts to film E.M. Forrester's fabulous novel of the same name. The film is a gorgeous love story with a overriding social commentary that pokes fun at English sensibilities at the turn of the century. Starring oh-so-young versions of Helena Bonham Carter as Lucy Honeychurch and Daniel Day Lewis as her pompous fiance Cecil Vyse; Julian Sands is Lucy's paramour George; the great Denholm Elliott is his father Mr. Elliott; Julie Dench is writer Eleanor Lavish - gotta love that name! - Simon Callow plays Reverend Beade and the great Maggie Smith is Lucy's cousin and chaperon, and ever-in-a-muddle, Charlotte. The film is rich on too many levels to count and the scene of Lucy coming upon George in the field high above Florence remains one of this reviewers most favourite movie scenes of all time.